Info "My back is killing me! Help me straighten it out!" 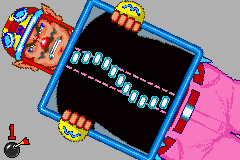 Alignment is one of Wario-Man's microgames in WarioWare: Twisted! Wario's spine is hurting him because the spine cells are not in line. The player must tilt the system to line the cells up to win. Level 1 - The cells are in a wavy motion. Level 2 - The cells are a little bit far from the middle area. Level 3 - The cells are more far out than the middle area. This page was last edited on September 27, 2018, at 18:40.